I don’t have a page in this site that this belongs on, so I’m just throwing this post out there for anyone who might be interested. This model appears to be discontinued already (2012) but the replacement (the Pandora Mini) looks excellent and sells for only USD100. Processor, tuner, phrase trainer and USB interface for electric guitar and bass players. I felt the urge to replace my 10-year-old DigiTech RP100 pedal. As nice a device as it was, it wasn’t the most convenient for me, mainly because I don’t play live. I was tired of having to stick the pedal up on the table to edit things. And I thought I had got all the best sounds out of it I could get. So my plan was to get a new efx processor for my guitar, but also soup up the axe by replacing the old pickup set with EMG active pickups. Before I did any of that however, I paid the local guitar experts to set up and intonate the guitar. This was long overdue and made the instrument 100 times more enjoyable to play. The Korg can be used live which I’ll talk about later but that is not the way I use it, so this review will be mostly aimed at the studionaut. The simplest way to begin, once you tear it out of its box (batteries included!) is to plug in your instrument, connect your amp to its output and just start hitting presets. There are 100 presets and 100 user patch slots. The last 30 presets have names that begin with “B ” and are particularly optimized for bass. There are 4 dedicated buttons A-D for your absolute favorite patches. The other way to access a group of your favorite patches quickly is to copy them into adjacent user slots. For instance, I liked patches P00, P02, P04, P09, P17, etc., so I copied them to user memory locations U00, U01, U02, U03, etc. You can then tweak those Unn patches, match their output levels, etc. The coolest thing is to hook up the USB connection and install the Pandora patch editor. This makes it simple to try patches, which you can then also save from and load to the device. If you for some reason find the 100 user patches too few, you can create your own banks and download them when you need them. As is often the case in these type of devices, in a lot of cases they can only hint at the amp models they are intending to emulate. It’s fun to try to guess which models they are intending to refer to. UKBLUES (“UK-manufactured vintage stack guitar amp head”) Orange, Marshall, Hiwatt? The next feature you need to play with is the Rhythm section. This consists of 120 rhythm patterns, including a number in non-4/4 rhythms, and 8 metronome patterns. The cool thing is that most rhythm patterns have 4 bass options: off, basic pattern, variation 1 (major key) and variation 2 (minor key) for your selected root note. You can string up to 16 patterns in a Chain. Up to 20 Chains can be stored. The rhythm set sounds OK but you can tell just one sample is used for the snare which becomes a little mechanical after a while. This is a very powerful and handy feature. You select a phrase buffer length of 20, 40 or 80 seconds, and you can either record your instrument, and audio source or even load a loop into the device via your computer. Then you can play it back in a loop and work out your leads or rhythm parts with it. A cool feature is the speed adjustment where you can set the playback speed to one of 6 values from 50% to 100% of original. It’s not a high fidelity adjustment but useful for practice. In a nutshell, this is an extremely feature rich, well designed, compact and useful device. The criticisms I have of it are so minor as to be negligible. I think for around USD200 or even less it represents and excellent value. 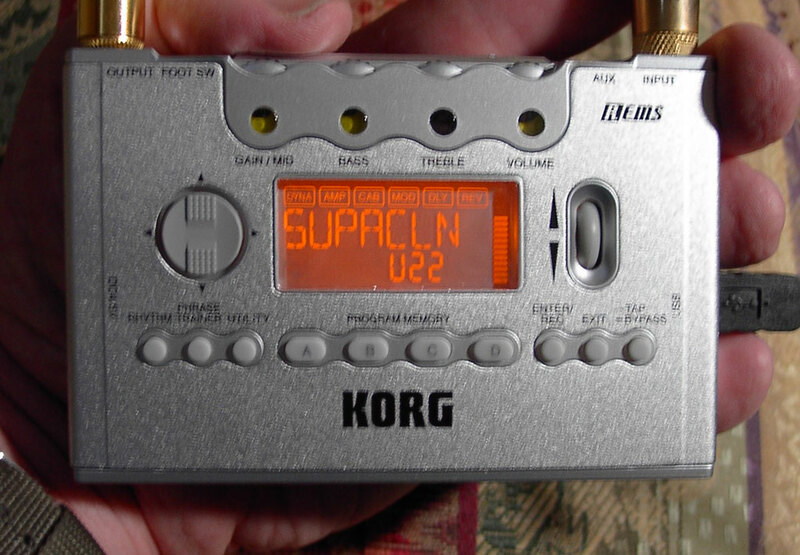 Korg may not be the first name you think of when it comes to guitar effect but it’s well worth checking this out.